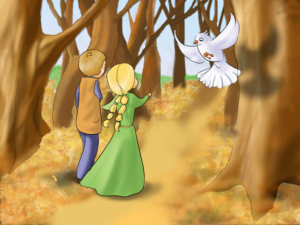 Once upon a time there were two children, a brother and a sister, whose names were Hansel and Gretel. They lived with their father and with their step-mother. Their father worked as a woodcutter. 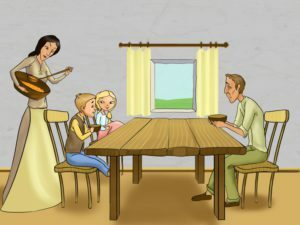 Times were hard and the family had a tough life. One night the children were woken up by a conversation in the next room. “They eat far too much. If they keep on like this, soon we’ll all die of starvation. We must get rid of them. Let’s do it tomorrow,” they heard their step-mother say. “I don’t want to abandon my children, ”said their father. He didn't think the plan was a good idea. But his wife was very persistent and she kept talking and talking until he was convinced and willing to do what she said. 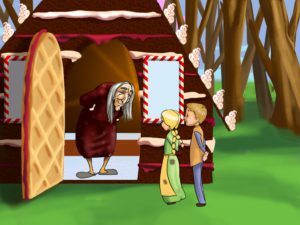 “Hansel, tomorrow we are going to die,” whimpered Gretel, “what shall we do?” Hansel reassured his sister that they would survive. 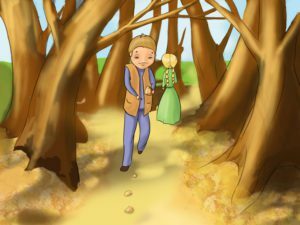 “Get a good night’s sleep!” he soothed, and as soon as his sister fell asleep, he went outside and filled his pockets with as many white pebbles as he could. Then he went to bed. The next morning the family woke up early, before sunrise. “Today we’re going to cut some wood for the winter. It’s going to be a long day,” said their step-mother. 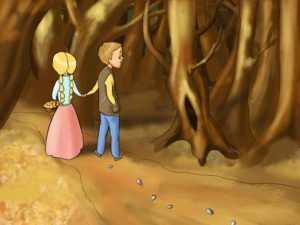 “Take these pieces of bread and don’t eat them before noon,because then you will get hungry too early.” Hansel gave his bread to Gretel to hold, because his pockets were full of pebbles. They went deep into the forest. 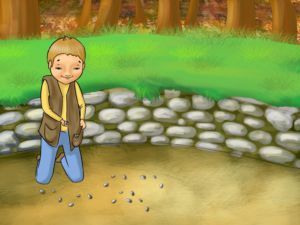 On the way Hansel stopped every few steps and dropped a pebble behind him without telling anyone. After a while, they stopped. The step-mother told the children to sit there and wait quietly for them to come back. Their father said nothing. They did just as Hansel had said. They next morning they followed the trail Hansel had made and they made their way home. 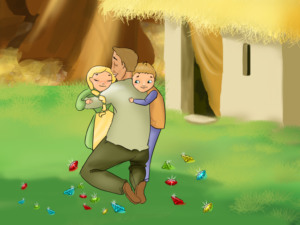 Their father was so happy to see them, that he couldn't say a thing and just hugged them for as long as he could. 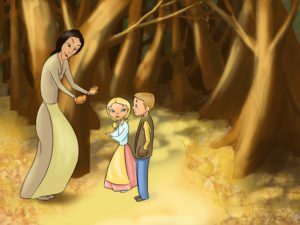 When evening came, the children heard their step-mother’s voice, “We will leave them somewhere even further into the forest next time, so they won’t be able to find their way back.” “What are you talking about?! We are not going to leave them alone in the woods again!” But the women persisted, “Do you want to die of starvation?” The man didn’t reply. Hansel went to try and gather pebbles again, but this time the door was locked. At lunch Gretel shared her piece of bread with Hansel and then they fell asleep. 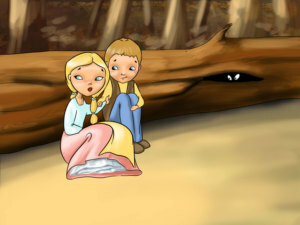 It was already evening when they woke up and it was too dark to find the crumbs, but Hansel told Gretel to keep calm and that they would go home the next morning. When they woke up, they saw that wild animals had eaten the crumbs during the night. This time it was Hansel who was upset. “We will never find our way home now,” he cried. 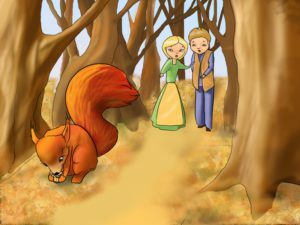 But this time it was Gretel’s turn to be brave. “Let’s walk. I’m sure we’ll be able to find our house,” she said. They walked the entire day. They were already very hungry and tired when they saw a white bird singing on a branch. It flew off and the children decided to follow him. It led them to a house. 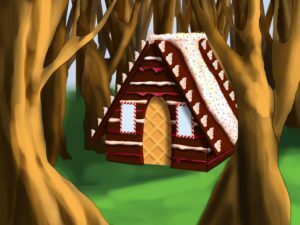 When they came closer, they saw that the house was built entirely from chocolate, with a roof made of cake, and windows made of clear sugar. 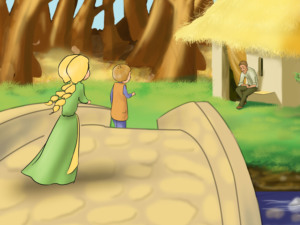 The children started eating the house – Hansel took a piece of the roof, while Gretel tore down a part of the wall. They went in. 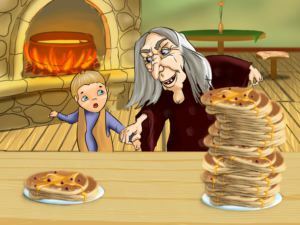 The old woman made them pancakes with maple syrup and gave them milk to drink. 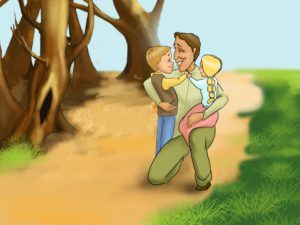 Just when the brother and sister thought they were in heaven, the old woman grabbed Hansel by the hand, her eyes glittered red and she laughed a creepy laugh. “Stupid children! Didn’t you understand that I made this house to lure you in? 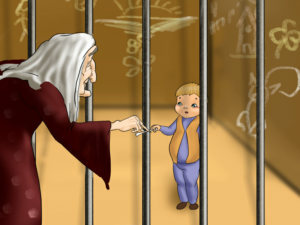 I will now fatten you up, boy, so that I can eat you.” She dragged Hansel into a small dark room and locked him up. 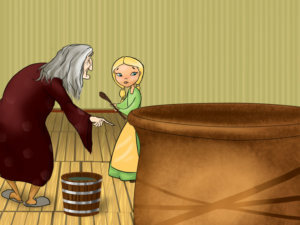 Only then did Hansel and Gretel understand that she was not a nice old lady at all, but a witch! Her eyes were red and she was older than any human alive. She had terrible eyesight, but a very good sense of smell. 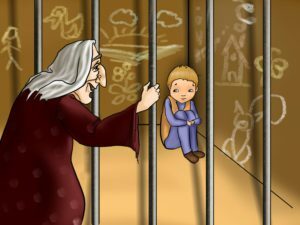 No matter how much the children cried, the witch had no mercy on them. “Come on, girl, start cooking something delicious for your brother. 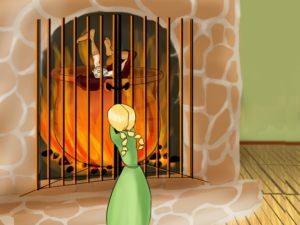 By the end of the month he should have got fat enough to be cooked.” Gretel had no other option, so she started cooking for her brother. 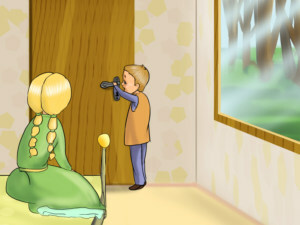 A week passed like that – Hansel ate delicious food, while Gretel was always hungry. Every morning the old woman went to Hansel’s room and shouted, “Show me your finger boy, let me see if you have gained any weight.” But Hansel would stick out a little bone and because the witch couldn’t see very well, she thought it was his finger. She was furious that he was staying so thin. “What is wrong with you?” the witch yelled, “It’s so easy! Look, you just need to step here and…. aaaaaaaaaaahhh!! 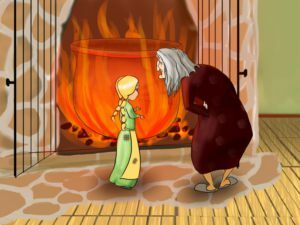 !” Gretel shoved the old woman into the oven. Then she quickly closed the oven door. The vicious witch burned to a crisp. How happy they were! Before they left the house, they went into the witch’s bedroom where they knew she kept her treasure. 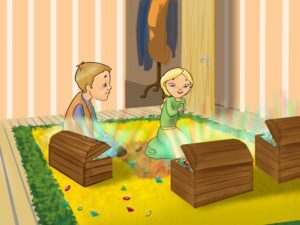 There were wooden chests all over the room and the children filled their pockets with as many gems as they could. “These are better than pebbles,” said Hansel when he was done filling his pockets. Then they left the house. 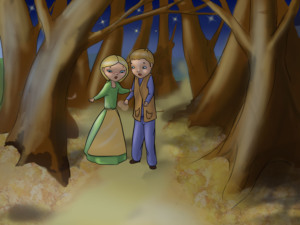 The brother and sister walked for a few hours before they managed to leave the witch’s wood. The sun was setting when they finally got to a bridge they knew well, which was close to their house. “Father!” screamed Gretel when she saw him at the porch, looking more miserable than ever, because his wife had died. “My dearest children! You are alive!” their father exclaimed joyfully and the three of them hugged. 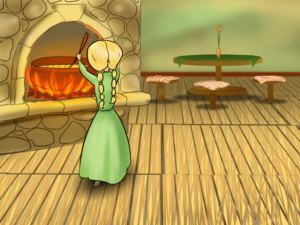 Gretel shook out her apron and the precious stones started falling onto the ground. Hansel joined in and took out all the pearls and diamonds which he had stuffed into his pockets. Finally they could have a carefree life and live happily ever after together!